Sterile cell culture insert. Track-etched polyethylene terephthalate (PET) membranes have a smooth surface and defined cylindrical pores that traverse the membrane. Low-protein binding. Sterilized by gamma irradiation. Packed in Individual blister packs. Innovative hanging design facilitates pipetting and allows for co-culture. Membranes are easily removed, easy to handle, and remain flat. Applications include visualization by light microscopy; transmission and scanning electron microscopy; studying transport of larger molecules (lipoproteins) and viruses; transendothelial migration, smooth muscle migration; barrier function (TEER measurements). Note: In long-term cultivation, epithelial cells grown in monolayer may traverse a naked membrane and grow on the top and bottom. DNR (Latex) free. Growth area: 0.3 Sq. cm. Uncoated membranes growth surface. PET (polyethylene terephthalate) membrane and housing material. Pore size: 3.0 micrometers. Size: 24-well Typical working volume: 0.2 - 0.35mL. 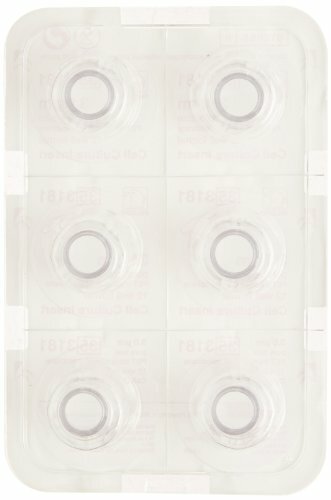 Cell sterile culture inserts for 12-well plates. 8.0 micrometer pores, Transparent PET Membrane. Track-etched polyethylene terephthalate (PET) membranes have a smooth surface and defined cylindrical pores that traverse the membrane. Low-protein binding. Sterilized by gamma irradiation. Packed in individual blister packs. Innovative hanging design facilitates pipetting and allows for co-culture. Membranes are easily removed, easy to handle, and remain flat. Applications include study of tumor invasion; migration; chemotaxis; metastasis. DNR (Latex) free. 0.9 sq. cm growth area. Uncoated membranes growth surface. 0.4-1.0mL typical working volume. Sterile 24-well Cell Culture Insert Companion Plate with lid, tissue-culture treated polystyrene. Designed to eliminate evaporation and contamination due to improper lid fit. Flanges on inserts fit into notches on plate wells. In "feeding" position, insert slides to side of the well for easy pipet access. In "incubation" position, insert remains locked in position in the companion plate well, minimizing media wicking. 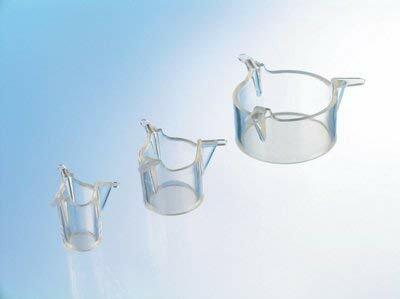 Companion plates are tissue culture treated and can be used with or without inserts. Individually packaged in peel-open trays. Sterilized by gamma irradiation. DNR (Latex) free. 2.0 sq. cm Growth area. 0.7-0.9mL Typical working volume. 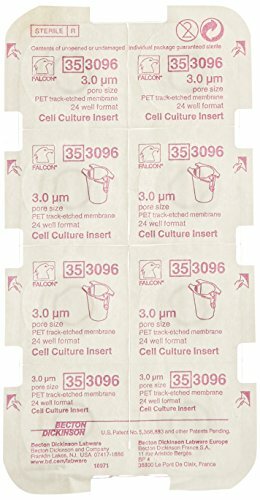 Corning BioCoat Control Cell Culture Inserts consist of PET membrane (1.0micrometers) 6-Well permeable supports that are packaged ready to use in Falcon companion plates. Corning BioCoat Control Cell Culture Inserts are Falcon cell culture inserts without ECM. They are packaged, ready-to-use in Falcon cell culture insert companion plates. They may be used as control inserts alongside ECM-treated inserts while studying the effects of the ECM component present on the Biocoat cell culture inserts. 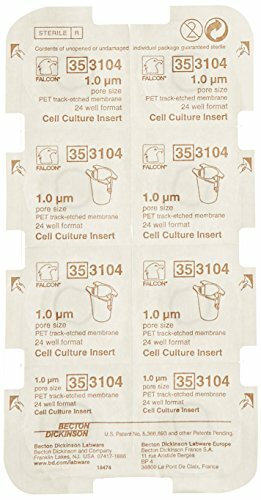 FluoroBlok Fibronectin Cell Culture Inserts are tested for their ability to promote attachment and spreading of BHK-21 hamster kidney cells. Supplied in ready-to-use Falcon Companion Tissue Culture Plates. Storage Conditions are stable for at least 3 months from date of shipment when stored at 2°- 8°C (36°- 46°F) unless otherwise specified. The Corning BioCoat Cell Culture Inserts Variety Packs include ready-to-use Falcon Companion Tissue Culture Plates. Supplied with pre-applied extracellular matrices, facilitating cell adaption to in vitro cultivation. Useful in determining optimal substrates for growth or differentiation of specific cell types or to study interactions between cells and various ECM components. Recommended Storage: Stable for at least 3 months at 2° to 8°C (36° to 46°F). Cell culture inserts for 12-well plates. 0.4 micrometer pores, Translucent, High Density PET Membrane. Track-etched polyethylene terephthalate (PET) membranes have a smooth surface and defined cylindrical pores that traverse the membrane. Low-protein binding. Sterilized by gamma irradiation. Packed in individual blister packs. Innovative hanging design facilitates pipetting and allows for co-culture. Membranes are easily removed, easy to handle, and remain flat. Applications include transport, diffusion, and secretion of small molecules into, out of, or through a cell monolayer; barrier function (TEER measurements). DNR (Latex) free. 0.9 sq. cm growth area. Uncoated membranes growth surface. 0.4-1.0mL typical working volume. This pore size offers maximum diffusion of large molecules or viruses. Sterile cell culture insert. Track-etched polyethylene terephthalate (PET) membranes have a smooth surface and defined cylindrical pores that traverse the membrane. Low-protein binding. Sterilized by gamma irradiation. Packed in Individual blister packs. Innovative hanging design facilitates pipetting and allows for co-culture. Membranes are easily removed, easy to handle, and remain flat. Applications include scanning and transmission electron microscopy; visualization of live cells by light microscopy; removal of membrane from housing; immunocytochemical staining. DNR (Latex) free. Growth area: 0.3 Sq. cm. Uncoated membranes growth surface. PET (polyethylene terephthalate) membrane and housing material. Pore size: 1.0 micrometers. Size: 24-well. Sterile. Typical working volume: 0.2 - 0.35mL. Thinker cell culture inserts are produced from high-grade clear polystyrene housings, and polyethylene terephthalate (pet) capillary Pore membranes. Both materials, polystyrene and pet, are USP Class VI certified and cell culture compatible. The coupling between the housing and the membrane is achieved using an automated process which produces an extremely strong and robust seal without compromising or weakening the membrane in any way. The membranes undergo a physical surface treatment to optimize cellular adherence and growth characteristics. All the capillary pores in a membrane exhibit a high degree of uniformity in diameter. This uniformity ensures reliable and consistent exchange rates between the two compartments and thus provides reproducibility when conducting multiple experiments.